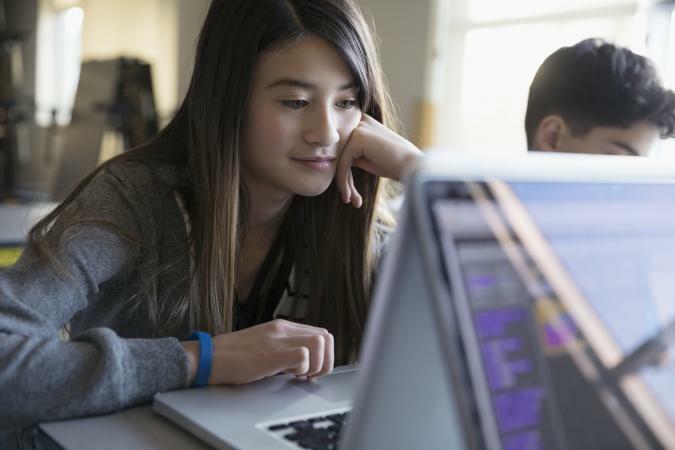 If you want to apply to a traditional, four-year college, get a leg up on scholarship applications or make the college application process is easier, you need a high school resume. Creating a resume can help you pull together all your information in one spot so you can easily summarize your high school career. The following two samples each have a unique format and highlights based on the career and college goals of two different students. To download, click on the image of the sample you want and use. Each sample is customizable so you can create a resume that truly represents you. If you have issues, see the troubleshooting guide for online printables. This resume template is narrative in nature, meaning that it offers some explanation as to the nature of the activities the student engaged in. In addition, it makes a point to highlight test scores and difficult coursework - both of which are important to STEM programs. 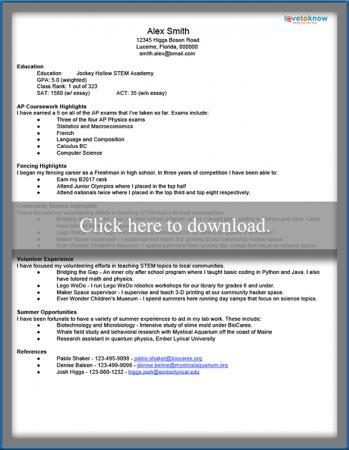 Students going to a more humanities-based program might appreciate a resume that looks more traditional in nature. It highlights important details from the students time in high school without being too wordy. You need to think about your resume as the prime real estate of your high school career. What is most outstanding about you as a student? The resume is a time to showcase both things that make you stand out, as well as information you think makes you an especially attractive student. You should always make sure your resume is no more than one page and include a variety of information. Basics - Make sure you include your name and contact information. Academics - You'll generally want to include your GPA and class rank and SAT or ACT scores. You might want to include the nature of your studies (ie Honors, AP, or IB) if they are essential to your intended major. Extracurriculars - Include things you are passionate about, spent a lot of time on, or are related to a future field of study. Sports Accomplishments - If sports was a major part of your high school career or if you plan to play in college, you should have a section devoted to your leadership and accomplishments. Leadership positions - This may or may not be a separate section. It is okay to discuss leadership and extracurriculars together if that makes sense for the formatting of your resume. Volunteer Service - You may want to note how many hours per week something took in addition to any initiative you took to make these things happen. Summer Activities - The most highly competitive programs are hoping you took the summers to engage in learning activities. Whether it's language camp, extra classes, or something else that's interesting, if you used your time off for learning - make sure and note that. Honors and Awards - If you won a major national award such as an Honor Society, or if the award is self-explanatory in its title (ie Principal's Award for Academic Excellent), you do not need to explain these. However, if you won something that might not be familiar to everyone reading your resume, make sure to add a brief explanation. Additional Skills - Fluent in German or even Elvish? Go ahead and note it on your resume. If you love to garden or took classes as a natural illustrator - note that too. Not everything on your resume has to be leadership positions held or awards won. Things related to your major - If you have had a major accomplishment related to something you want to study, note it separately. This could be research, field study or any other award. Arts majors, whether they are performing or visual, will often be allowed two page resumes. 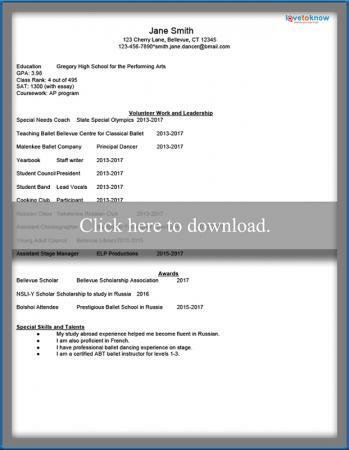 One page will be academic and extracurricular accomplishments, and the other page will list your most important accomplishments in the arts as a high school student. Each area of the arts frequently has a different way they handle resumes, and different schools may ask for the information differently. If you are giving the resume to a school on your application, it is best to contact them in advance and ask how they want the information formatted. Embellish or fib - It might be tempting to make yourself stand out more by embellishing a leadership position or saying you were involved in something when really you attended one meeting - but don't. Colleges want to know who you are, not who you wish you were. Highlight negative information - If you weren't a top student, focus on how you've improved your grades over the last few years rather than just giving a GPA. If you have high test scores but mediocre GPA, put the test scores higher on the resume. Have an immature email handle - If your email address is something like googlyeyedgirl@bmail.com - it's time to change it. Some combination of your name or initials generally works best. Get too creative with formatting - Format your resume traditionally and don't get too creative. You want someone to be able to look at it quickly and feel like they have a good grasp of who you are. Fancy colors, perfumed paper, or anything similar is not appropriate. There are a variety of reasons why doing a resume is a great idea. You can use it in lots of places, and it's becoming the 'norm' that students have them. Having all of your accomplishments, volunteer work and other opportunities in one place is incredibly handy when you start filling out college and scholarship applications. If for no other reason, create one so you have the information gathered for you. If you are interested in playing sports or taking part of a team that represents the university (ie like Model UN or debate), give your resume to your potential coach as a way to introduce yourself. Asking for a letter of recommendation? Whoever you're asking knows you from one place, so giving that person your resume helps give them a better snapshot and can also ensure they get dates right. Nothing looks worse than you saying you've known your coach for three years when they say they've known you for two. You can give your resume to an advisor or professor at a school if you're very interested in a particular major. Only do this if you've accomplished something noteworthy related to that major. Likewise, give your resume, as a freshman in college, to a professor with whom you're interested in doing research. This helps give them information on your background when you don't necessarily have a lot of experience. Use your resume for college interviews. This often helps the interview be less awkward because now the interviewer has a sheet to refer to for questions. A lot of scholarship applications ask either for a resume or for all the information on it. If you plan on applying for money, keep this handy for quicker applications. Will a Resume Get You In? A resume won't necessarily get you into the college of your dreams. However, it shows people that you are a serious and capable person who really wants to be a contributor to the campus. Use your resume wisely, and at the very least, it will help make the process less stressful for you.